I picked up an MHS-5200A DDS Signal Generator for about US$80 on eBay. The Windows software is horrible, plus it is in Windows. Would probably work in Wine, but I can't get NI-VISA to install in Wine and don't really care. Here's what I know so far. Corrections or comments welcome. By the way, the software is listed as for the 5200 or the 3200 but a different document on the 3200 shows a pretty different protocol so the software must adapt. I didn't bother trying to operate the instrument from the software (although you can), I only care about loading the arbitrary waveform memories. Nice, I should give this a try on my MHS-3225. Wonder if they are compatible. Just re-read your first post, and noticed the protocol is different. Yup. In addition, I have a bug somewhere. It only works when I have the port open with some test software. I am trying to fix that this morning. Worse case, I'll rewrite in C.
Ok, fixed and enhanced. I have a few more pushes today and then hopefully done at least for now. Care to open up and have a look if the difference is pure in firmware or they add in the more expensive ones some kind of additional ( hardware?) sine wave generator. Yes it is on my list, although the cost difference between the units is pretty small so I just got the 25MHz one. I think the span is about $10 from low to high, but I might be remembering wrong. What I am currently about 1/2 way done with is a setup that will create a virtual file system (like ~/dds with a subdirectory for each slot. Then it launches waveman or another editor of your choice. You save your wave to (for example) ~/dds/5 and it sends it to the instrument and moves the file to ~/dds/5/sent for future reference. That would make using waveman a lot easier. Almost done with it and will update github when it is done. I just posted a draft version of the wavegen script. You WILL have to edit it for your use. Basically, it creates some directories and launches the TTI editor (or any editor). 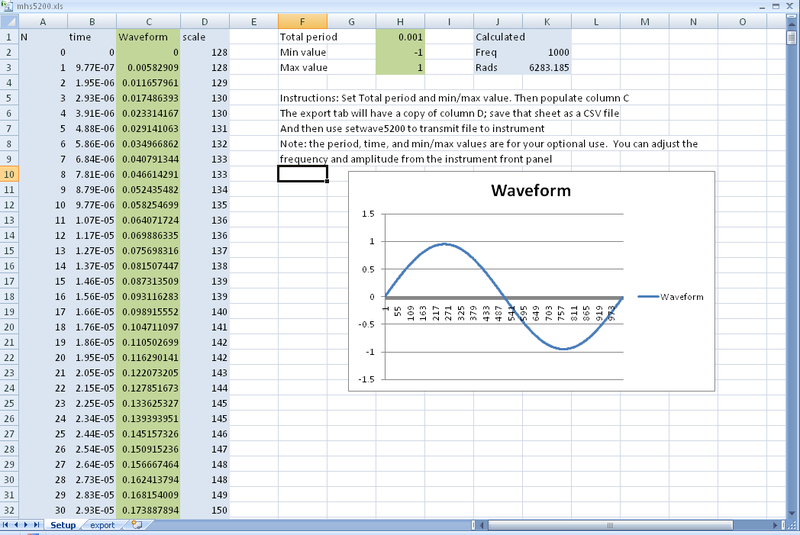 Then you simply save your file in CSV or NRM format into the directory you want and the download happens magically. For example, I save to ~/dds/4 to write to slot 4. Does anybody know what else is the difference between MHS-3200A and MHS-5200A? The specs are exactly the same. 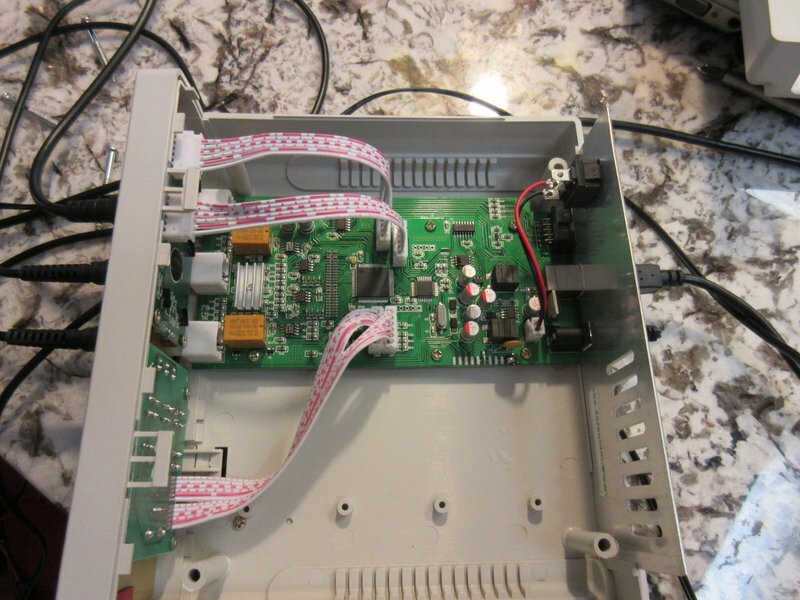 I have received my 25MHz unit and it is pretty much the same as in the photo. The architecture seems to be an STM8 micro (small TQFP on the right) handling the coms & display, CH340G (upper right TSOP) usb uart bridge deals with the USB part. The signals are produced by a Lattice MachXO2 CPLD/FPGA (large QFT in the center) with 2 8bit resistor DACs (left of it) with some opamps (immediately left of the DAC ladders) and AD603ARs (left from the opams). I didn't remove the heatsink, so not sure what is under it - perhaps some power transistors. The rest is not very interesting - there are relays to switch the outputs on and off, standard 2 line LCD, encoder knob on a separate board and a boatload of passives. The bottom right of the board is a switching PSU. It looks fairly well built, actually, especially for the price. I have seen much much worse already. However, what I would love to get is an English manual. The original is in Chinese, unfortunately. I still haven't figured how to actually use the counter functionality the unit is supposed to have nor how to use the various synchronization inputs, including the TTL inputs and outputs on header in the back. There isn't any separate gen for 25MHz and 6MHz square wave. 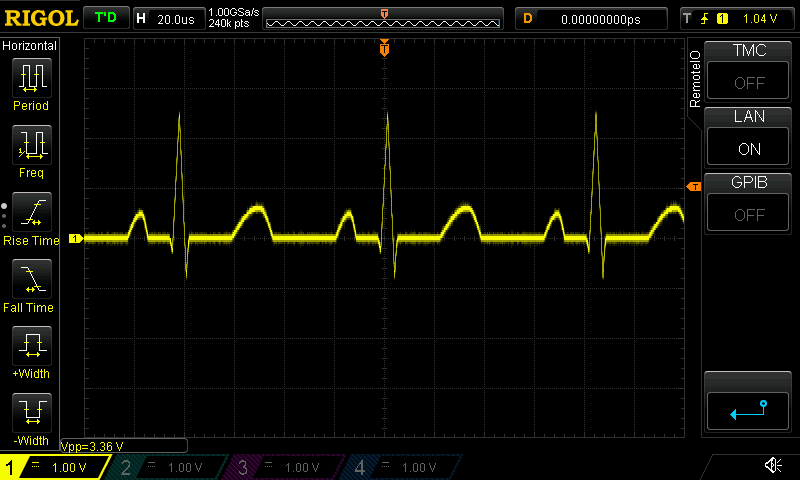 I have checked the signal on my scope and when set to square wave, the signal starts getting distorted around 1-2MHz and the higher you go, the more sine-like it looks, until you get basically straight sine wave above around 4-5MHz (it might do 6MHz, but I didn't probe it correctly). On the scope it looks like as if there was a heavy low pass filter and the higher harmonics were getting progressively cut from the signal as the frequency was increased. Not sure whether there is a physical low pass filter on the output or whether it is an artifact of the sampling. 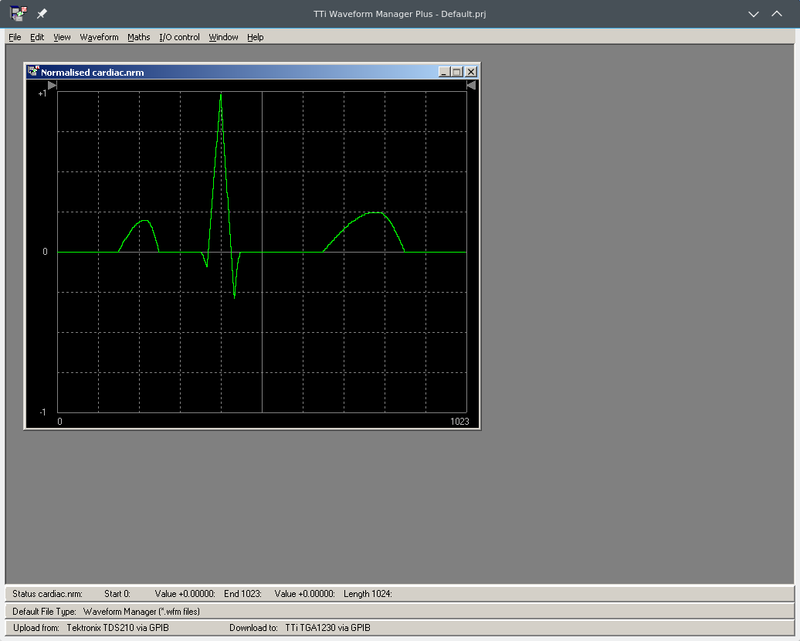 If you can't stand not having a GUI, I found the TTI Waveform Manager Plus runs well under Wine and is free to download (registration required). If you export to "normalized" you can import to the MHS5200A by using the -f flag to the software I provide. I would probably rather do it using Python or something like that though, shell/awk isn't the best choice for this type of job, not to mention that Python is a bit more portable than the above combo. BTW, a pro tip for anyone using this generator - record a waveform with a scope, save as CSV, open it using Waveman, clean up and upload to the generator. Bingo, signal reproduced for debugging stuff. Works like a charm! MSR-Sel. Press OK to go external or TTL. One of the menu items changes depending on your MSR-Mode (the one after Gate time). If it says C it is reading counts.pressing ok pauses. If it says F it is reading frequency. You can probably figure the rest out from there. BTW, any idea how the TTL outputs actually work? There are 8 outputs and in input. I guess the input is for the counter and perhaps to synchronize the frequency sweep, but how to use the outputs? Ouch, Cygwin ... I will probably try to hack a little app up to manage the uploads for this. Nope, haven't played with the TTL outputs yet. May I suggest sticking some sort of license on that document, at least on the translation and protocol documentation part? Perhaps CC-BY-SA or something like it. Very nice to see such nice work coming out of a community, in view of the vendor's underwhelming support. Initially I thought the translation will be useful to the manufacturer, but I pinged them by email and they didn't reply. I then essentially rewrote the thing, so I feel I am entitled to controlling the copyright, and of course I prefer a collaborative license like CC. Will do, although I will have to put this project off for a while now. By the way, it's written in LyX/LaTeX, and the source is on Github, so you're welcome to clone it and push patches. It uses quite a bit of optional packages/style files, easy to pick up from error messages if you start creating PDFs. By the way, I want a FOSS/Linux program to drive MHS5200. I considered writing a Python/Qt app, but it occurred to me that maybe it could be interfaced to sigrok: it already supports Hantek and Siglent generators. Thoughts? Alas, sigrok does not support signal generators as an instrument class yet. Those listed on the hardware support page are marked red (planned). You're welcome to take it on. And you're right, a UI for these just screams Python/Qt. Big kudos for this! This manual looks better than the original, even!